Sprawling level design, thrilling combat, and masterful indirect storytelling make Dark Souls 3 the best Dark Souls yet. I’m friends with a giant now. He tosses spears taller than me a thousand yards off towards a white birch. He wants to keep it safe from cursed villagers, and I can respect that. From up here the tree is a speck of brilliant white in sickly olive and grey. We stand together in silence for a while. The whole village is visible from atop his tower, all its ramshackle buildings and tortured denizens whose worship of a rotten greatwood has clearly gone awry. I can almost smell the mold. My job is to bring the ashes of the treasonous Lords of Cinder back to their thrones to prevent the apocalypse. Maybe it’d be better off that way. This world isn’t my friend. But this giant is, and if he cares about a little white tree, then I should too. That might be reason enough to keep this rotten place together. This is what makes Dark Souls 3 so profound. Sure, the thrilling, punishing combat and notoriously difficult boss battles are its titanium skeleton, but the language and ambiguity of the world are its flesh and blood—the beating heart that imbues an excellent third-person action RPG with mythic authenticity. Marred only by few performance hiccups, Dark Souls 3 is one of the most engrossing, cohesive games I’ve ever played, and the most focused, potent game in the series. Like it’s predecessors, Dark Souls 3 is an eerie Japanese spin on western fantasy that tells a surreal story in broad, vague strokes. You still kill monsters, collect souls, and use them to level up a short list of primary stats. Dying means you lose your souls and respawn at the bonfire you last rested at. Run back to pick them up and carry on, hopefully further this time, but die before reaching them and they’re gone for good. It’s a harsh system that blankets every foray into new territory with uncertainty and tension. I spent most of the game with my shield up, tip-toeing. Because so many more enemies can appear on screen than in previous Dark Souls games, extremely cautious play is rewarded. Instead of a few undead soldiers, I regularly ran into, for example, 10 armed undead villagers, a corpse dog or two, and a beefy spellcaster. With a lot to deal with at once, and very early on, I noticed myself prioritizing enemies, studying the arena, and dipping into my deep arsenal more often than before. In this instance, I could light up a gunpowder barrel with my pyro’s fireball, skirt the edges of the arena to take out the smaller enemies, and then focus exclusively on the spellcaster. Dark Souls 3 sets up even more chaotic arenas throughout and accommodates with attacks that execute much faster than prior Souls games, shifting the focus to improvisational crowd management. But every swing and dodge roll is still an uninterruptable commitment, and shields haven’t lost their importance, so with enemies rushing from every side, quicker attacks are an exciting, necessary addition. If I died, it was usually because I rushed into the fray too soon or wasn’t properly outfitted—though the camera did get me killed a few times. About four times, a pillar or wall got stuck between my vision and my character. The camera feels like less of a problem than in previous Dark Souls game, but since death comes so easily, its quirks are still frustrating. Enemy design is more diverse than ever; long-haired skeletal spider people sucked my face off, fire witches reduced me to ashes from a hundred yards off, and the icy quadrupedal Irithyll knights chopped me up into a big bowl of frosted flakes. Alone, they’re already a challenge, but I rarely found any baddie without a buddy. Well-paced level design kept frustration from death to a minimum. Bonfires and unlockable shortcuts typically showed up just before I ran out of healing items, and more importantly, willpower. Dark Souls’ difficulty has always been in service of building on themes of desperation and despair, rather than being hard for the sake of ‘get gud’ video game egos worldwide. One of my favorite changes, and likely a controversial one, is how Dark Souls 3 plays around with boss design to get those ideas across, throwing a few less challenging, but more thematically playful opponents into the mix. This isn’t to say any of them are simple. Each demanded the attention of my deep arsenal, pattern recognition, and the level design in order to take out. Some are towering monstrosities with multiple stages that change pace in an instant. Others are somber battles with pitiable opponents that made me wish I could sheathe my sword and show mercy. Some took a few tries, others (a certain dancer comes to mind) took me closer to two hours. No matter the ease or lack of, every victory elicited a jump, a shout, shaking hands, each of those reflexes at once. They’re challenging, engaging, animated with ferocity and elegance, and scored by a choral orchestra that further describes their themes and emotional backdrop. The entire score is melancholic fury, perfectly suited for an endless stream of YouTube metal covers. And whether the deathblow is delivered by the fungal arm of a rotten greatwood or the jagged teeth of a small rat, death encourages experimentation: should I dip into the massive selection of weapons and armor, give a few miracles a whirl, or explore a different area and come back later with new talents and a sweet moon scythe in tow? I almost didn't finish the game in time for review because I liked tinkering with my gear sets so much, even if menus and inventory management still don’t have the most logical hierarchy or layout. Comparing items or equipping consumables can be a clumsy puzzle. That said, I found over fifty weapons, twenty armor sets, and about 40 rings (there are over 100, I hear) in my first playthrough. New game plus promises even more unique items. I hardly touched sorcery and advanced pyromancy, each with an intimidating amount of buffs, magic missiles, and area of effect spells. Bows are also much more viable this time around, easy to equip and quick to fire. The amount variability in character builds difficult to comprehend, which is especially exciting for fans of PvP. I played Dark Souls 3 on a GTX 960 system and a GTX 980 Ti system, and it runs pretty well on both. The 960 hangs out between 30 and 60 frames per second with maxed settings at 1920x1080, while the 980 Ti maintains 60 without issue at 2560x1440. Options are fairly limited (see them here), loading new areas can hack up the framerate on occasion, and one late game area dropped the fps to 40 on average, and the fps are capped at 60. We don’t love it when games have a framerate cap, but this masterpiece runs smoothly far more often than not and looks gorgeous, so we've afforded it some lenience. For an in-depth breakdown, check out Durante's Dark Souls 3 port analysis. To start harassing or helping other online players, you first need to consume an Ember. These raise your health by a hefty amount, but also open you up to random invasions. Covenants are hidden throughout Lothric, each with their own lore and mechanically driven goals. One is essentially on-call bodyguard duty. If a player in your covenant is invaded by an enemy player, you can answer the call to join their game and hunt the hunters. My favorite covenant rewards successful invasions with player tongues, which I can hand over to my covenant leader to reallocate my stats, change my appearance, or boost my leaderboard standing. I was only invaded a handful of times, and several were scripted NPC invasions, but each was a frenzied dance, prolonged by Estus Flask heals that leave the player vulnerable for a few seconds, but outpaced the speed at which I could damage them. Healing is no longer certain death, but a very desperate maneuver to reset the playing field. PvP in Dark Souls 3 remains a spontaneous layer over what is already a tense, unpredictable journey, but the lasting appeal of battling player phantoms is still up in the air. The community needs time to dig into PvP builds and to try on the meta for size. Competitive play is rarely without early issues, so here’s to hoping FromSoftware tends to its garden. Beyond the cursed undead village where my giant friend keeps watch, I notice the pale blue fog blanketing the Irithyll Valley. The seemingly abandoned ruins rest below Archdragon Peak. Rounding out the panorama is a series of fetid swamps, dimly lit by three towers of fire below the bridge to Lothric Castle, a mass confusion of medieval towers and parapets shooting into the sky. I can see where I’ve been and where I’m going, even if I don’t know it yet. The environments are connected in such a way that it makes spatial sense—it has to, since navigation depends sense of direction and memory. There’s no in-game map to reference. But sweeping vistas crop up often, and not just because they’re pretty (so very pretty), but because they’re how I determined where to explore next. 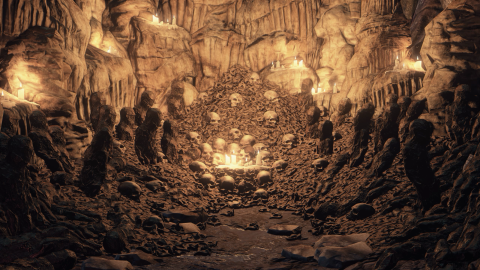 Unlike Dark Souls’ tightly wound, interconnected level design, the areas in Dark Souls 3 are fairly isolated, joined by a loose coil that snakes around the world with a few major forks, but no less masterful. Each area is a massive maze, featuring a sprawl of splitting paths, layers on layers of verticality, and more secrets than the space between your couch cushions. One particularly difficult stretch of combat (and a battle with the Indiana Jones’ rolling-ball-of-death trope flipped on its head) killed me more times than I can recall, until I happened to catch a glimpse into the crevasse I was sidling around. I could skip the entire 10 minute gauntlet by hopping down a few dimly lit platforms. Damn. I wanted to save everyone, even if they were dropping like flies or wanted me dead. The massive shortcut hidden in plain sight is one of many reminders to slow down and poke around Dark Souls 3’s innocuous corners; I couldn’t find a space that lacked relatively valuable purpose, revealing an item, a hidden character, a new enemy, or a story-related prop. My favorite props were explicit callbacks to previous games, of which there are plenty. But even without knowledge of the other Souls games, these quiet set pieces give enough implicit information to catch on, or to at least plant intrigue. And Dark Souls 3 is intriguing like no other game of its kind. It builds a world and an entire history through a sheer density of implicit information not possible in the previous Souls games. There’s an early string of environments that have been affected directly by Aldrich, Saint of the Deep. He’s one of the Lords of Cinder, a katamari of sentient goo leaving sickly signposts throughout the kingdom. Before I met Aldrich, I saw who he was and where he’d been: a small stone tableau depicting his congregation, the unfaltering dedication of his sworn cathedral knights (to pursue and kill me), throngs of walking corpses continually vomiting up maggots, the low ambient hum of whales in a corrupted forest—it’s all there to build the terrible myth of Aldrich, Saint of the Deep, but I had to study and draw the connections myself. Nearly everything in Dark Souls 3 is posed to generate questions (Why did these priests encase their heads in wax? Why are there dozens of dead pilgrims facing Lothric castle? Why does Aldrich want to devour everything?) and build towards seemingly imminent conclusions only to shatter them just a few paces before understanding. From the new pieces on the floor, the real questions take shape. They just take some work to put together. In my pursuit of those pieces, I stumbled into several hidden levels, a few so easy to miss that it’s hard to believe FromSoftware would spend as much time filling them out as much as they did. They feature unique enemies, complex bosses (arguably one of the best in the entire series—think mountaintops, lightning, and wild Goku hair), and chunky doses of lore that a huge portion of players will likely never see, exhibiting a dedication to cryptic design and faith in the playerbase to exhaustively catalog every angle of Dark Souls 3 down to the most insignificant detail. I love a watercooler game. The mystery carries over into the cast of characters strewn about the world and recruited as companions in Firelink Shrine. They all work as vendors for specific classes, each with a personal storyline that can play out in several ways based on their relationships with other NPCs in the shrine and a few branching decision points. Early on, I lost a companion to my own greed, and another later due to differing ideals for Lothric’s future. Moral dilemmas, tragedy, and corruption constantly pull and tear at every character and play out in surprising ways. Each feels fully formed, and thanks to excellent voice work across the board, their motives remain ambiguous. I wanted to save everyone, even if they were dropping like flies or wanted me dead. Perhaps my new giant friend got to me. I’m surprised he did at all. The added fidelity in Dark Souls 3 could have just been a simple upgrade in texture detail, but FromSoftware treats the extra space like a wider canvas, pushing their themes and story through every possible avenue—sound, music, enemy design, animation, dialogue, item descriptions, environmental cues—with more finesse and frequency than ever before. Dark Souls 3 gracefully nudges the series’ notoriously difficult action towards a greater artfulness that tests far more than reflexes. I was challenged to read environments and props like a novel, to empathize with Lothric’s imperfect inhabitants, and to ask whether or not I was trying to save anything worth saving. But there are no easy answers here, only 40-plus hours of tense action, awe-inspiring exploration, certain death, and big, bleak, beautiful questions. Take a seat, stay awhile. This is now how I remember church. "If substantiation be thy want, set thine eyes upon my charred corse. This sad cadav’r." Peek over the edge to see the next destination. Lothric Castle in the distance.